The Enterprise investigates a wrecked freighter and discovers that a number of escape pods could have reached a nearby system and the inhabited planet of Angel One. The planet is pre-warp and on par with mid 20th century Earth in terms of technology but has a global single state under a matriarchal leadership. Picard has Troi lead the opening contact and after some issues they are allowed to beam down a party which includes Riker, Data, Troi and Yar. They are taken before the ruling council which comprises of six "mistresses" and the "elected one" named Beata (Karen Montgomery) who is the voice of the planet, she allows the Enterprise to search for survivors on the promise of removing them. Meanwhile back on the Enterprise some of the crew fall under an infection, it looks like a severe cold or flu but it's rapidly spreading and the Enterprise is on a schedule to finish it's mission on Angel One then warp to the Neutral Zone to aid in a Romulan issue. Beata with her man toy. The Enterprise sensors track down the survivors of the freighter (all male) via the platinum they were carrying, the metal being absent from this world's ecology but it turns out they don't want to leave, they have wives and families and their crime is that they won't live as second class citizens and they don't want that for their make children either. The twist is revealed that one of the mistresses of the planet is secretly married to Ramsey the "leader" of the survivors but when Enterprise prepares to leave being unable to force repatriation Beata arrests the radicals and when they refuse to leave they are sentenced to death. Back on the Enterprise Crusher is having no luck, Picard and Worf are down for the count and Geordi is in command but more and more of the crew are sick and the pressure to get to the Neutral Zone is increasing. Data beams back to the ship and takes command but there is only really him running around but he won't leave until it's impossible for the crew to be cured and to make it on time to the Neutral zone. This leaves just enough time for Riker to make an impassioned plea on behalf of the condemned citing that martyring these people will not help in the long run and that the issues with Angel One are down to the culture evolving which would happen with or without the arrival of the male survivors of the Federation ship. First off what is with the Federation and Starfleet taking seven years to look in on the Odin and if Angel One is pre-warp why are they even visiting now let alone 60 odd years earlier (the Federations last visit). I thought it was also a stretch that a civilian freighter would have warp capable escape pods, you know the Enterprise doesn't even the saucer is only impulse. So Picard is spot on letting Troi lead the communications with the ruling government but then sends Riker down in the landing party and he is argumentative and judgmental from the word go, that was bizarre and I don't buy a lack of development for the 1st season. We did get one of the Data not knowing something he should in this case perfume, that gets old pretty quick and never made much sense given his pre Enterprise history. So they find Ramsey and his people via the platinum in his wings, wow they are good sensors to pick up a few ounces of a metal from orbit yet why didn't they just seal the deal by beaming everyone up, stripping them of weapons and job done. By going in person they not only get talked out of their promise to the elected one but also lead the government to the revolutionary element. That said score one for the boys when Trent (Leonard Crofoot) the personal assistant(?) 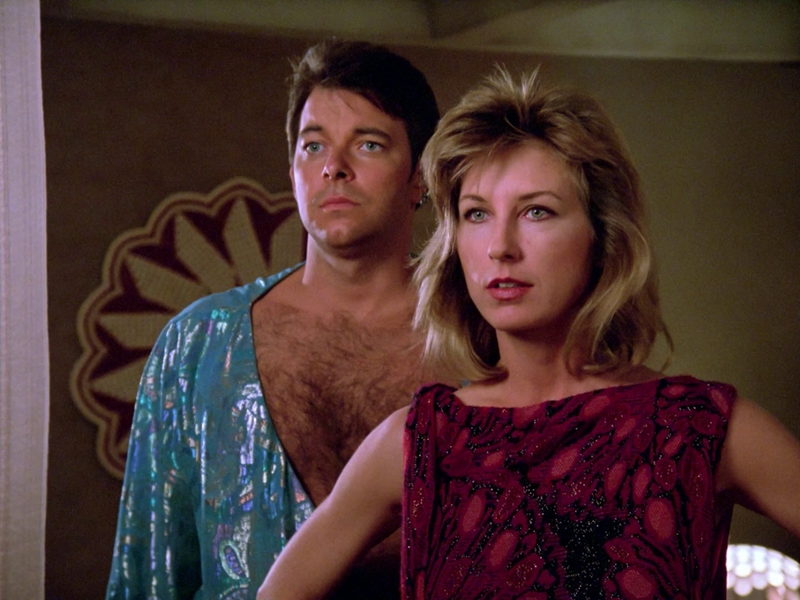 of the elected one gets to press the disintegration beam button, just the once because Riker saved the day and not with his man parts but with reasoned logic. Deep breath, Wesley what a useless waste of time, the infection showed how useless Crusher was and what the f**k is the Enterprise doing looking into a 7 year old incident when the Romulans are on a war footing in the Neutral Zone? 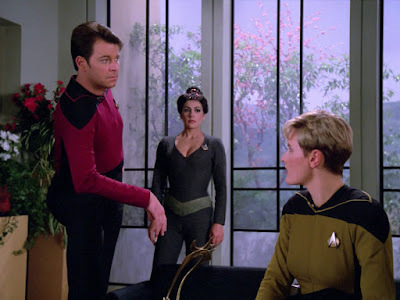 This was not a good episode, we did get Riker doing his patented leg up which is always worth a point and Troi was pretty useful even if she was sidelined but overall not a favourite.